I don’t make New Year’s resolutions. Usually by midnight on New Year’s Eve I’m not really in any position to make decisions that are supposed to last for the next 12 months. If I am still awake at midnight I’m probably out on the patio having martinis with all my cigarette smoking friends who are about to resolve to quit smoking. I resolve not to resolve. A lot of New Year’s resolutions are focused on better health, like quitting smoking, starting to work out or maybe eat more healthy food. No one resolves to drink better water, that’s too simple. It crosses my mind because with two or three stiff martinis in my gut I’m thinking a glass of water and some fresh air sound great. Water. Outside of oxygen in the air it’s the most important thing we consume. So important in fact, bottled water has become one of the biggest industries in America. Think about the water in your house. Depending on the region you live in, the type of water service you have and the plumbing in your home the water coming from your kitchen faucet probably tastes quite different than water at a friend’s house several hundred miles away. It seems like that should not be the case, it’s all water, right? The water at my brother’s house in Moore Oklahoma tastes completely different than water here in Kansas. When I went to Boulder Colorado a couple weeks ago the water tasted terrible to me. To people living in Boulder it tastes fine. For the most part if you live in the city or suburbs the water comes from a treatment plant where it is filtered and processed to make it “pure”. Chemicals are added to it to provide “benefit” to the consumer. Chlorine is popular. I don’t think chlorine should be in drinking water but who am I to say. I know it keeps swimming pools clean! If you live in a rural area you may get your water from a well. In the past this was considered to be quite pure, although sometimes it may have been a little cloudy or smell like sulfur. Regional legend tells us these hometown characteristics in water have certain benefits over other water. The water treatment plants like to mail a letter to their customers every year explaining the pureness of the water leaving the plant. This sounds great but I’ve always wondered about the 7 miles of plumbing the water travels through to get to our house. Some of that plumbing is pretty old, some of it travels through ground saturated by old industry, other bodies of underground water and other un-imaginable underground goodies. Water, like air, is susceptible to the environment around it. Air gets cloudy, and, it’s odor is effected by pollution and air borne contaminates. It smells different and may even be hard to take in. Water is the same. Treating the water in your own home is the key. 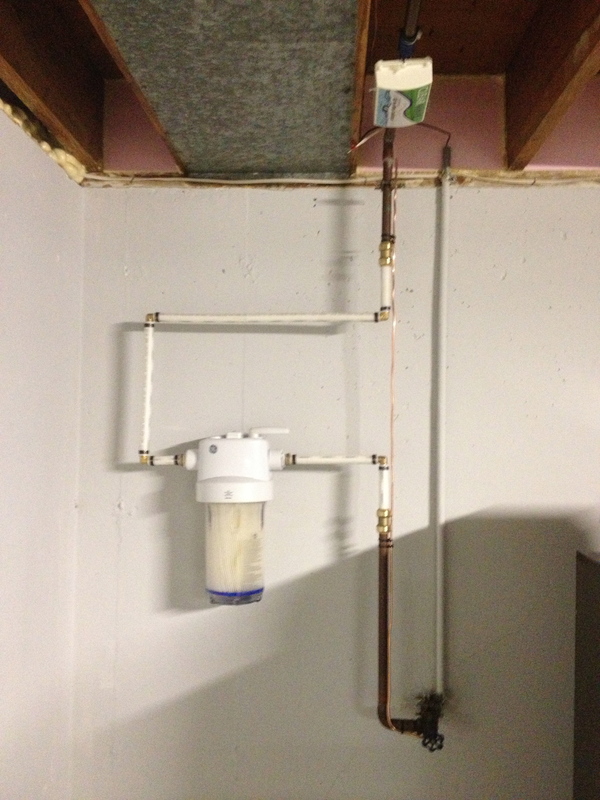 We have an under sink, carbon block filter with an ultra violet light. This filter is about the size of a big tea pitcher and is plumbed to the cold water. It has a dedicated faucet in the countertop. This is a mid range water treatment. There are smaller, simpler filters that attach to the end of the faucet, and there are whole house treatment systems installed in the basement or garage. I like the filter under the sink. 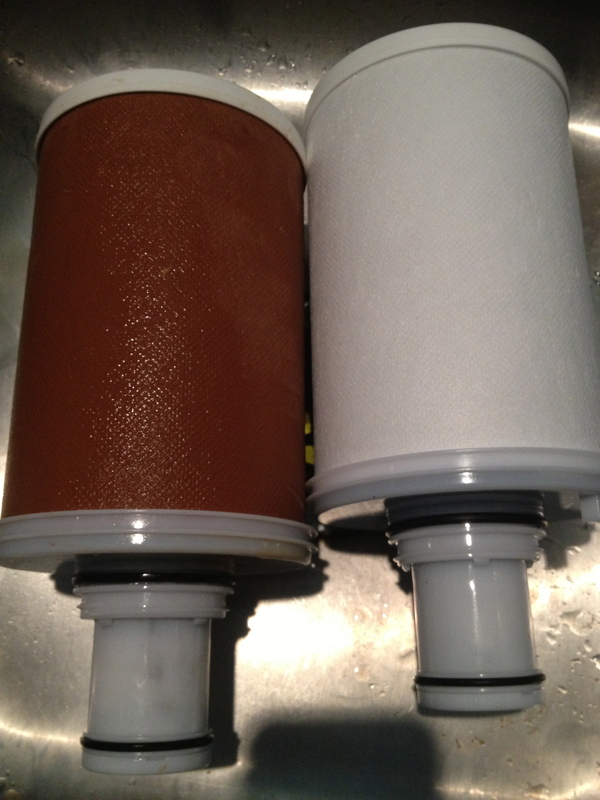 When I install a new filter cartridge every 1500 liters the filter is pure white on the outside. When I take it out to replace it the filter is rust orange, really rusty orange. So rusty orange I can’t imagine what my kidneys would look like if I were drinking this “pure” water. The carbon block is treated to remove chlorine and a host of other chemicals and flavors. The ultra violet light kills bacteria. I have to admit, even here in the same city water at other houses and public buildings has a very strong taste compared to the filtered water in our kitchen. And, I can’t get over the color of that filter when I replace it. The cost of using this filter is comparable to bottled water, actually much less, and does not include hauling it home in the car, storing it and then recycling dozens of bottles a month. Our coffee tastes better and if we need a pot of water for pasta or cooking we have it, filtered and lacking “regional character”. Some of my customers have so much sand in their water that their faucet aerators are always plugging up. Don’t try to clean these things out, it’s a pain. Just replace them. Low flow shower heads plug too. In these house I install a whole house filter. It has a timer on it to remind the customer to replace the cartridge every 90 days. Different cartridges are available to simply filter particulates and/or remove chlorine and odors. Some house have very elaborate filter systems that are more costly and do a more thorough job of treating the water. Water softeners are very popular and make showering luxurious compared to hard water. Water softeners do require the homeowner to haul and manage bags of salt or to pay a service to do so. If you resolved to improve your health this year include better water. Give the bottled water program the boot. Buy a few good dishwasher safe sports bottles and spend your money on a good water filter system for your home. Make a habit of drinking water you know is pure and clean. Like fresh air and exercise, pure water is a key component to your resolution to better health. Because it’s plumbed in, you’ll use it every day. Resolution or not it will be a lasting, valuable choice. Oh, did I mention, crystal clear, pure ice cubes just happen to make the best martinis. Cheers! Tags: bottled water, water treatment | Permalink.